There’s a favorite saying that the definition of insanity is doing the same thing over and over again and expecting different results. Municipal police departments across the nation thankfully don’t fall into that category as they’ve been coming up with creative solutions to recruit qualified candidates who will reflect the communities they serve. Rapid City is a perfect example of a community that has come up with a creative solution to what it saw as a problem with recruiting candidates that reflect its citizens. Of the 128 officers in the Rapid City Police Department only three self-identify as Native American in a community with a 12-20 percent population of Native Americans. It devised a program in cooperation with Western Dakota Technical Institute called the Akicita — pronounced A-kee-chi-ta — Mentorship Program. Rapid City Police Department Assistant Chief Don Hedrick said the program was born of a community advisory group made up of people from a variety of backgrounds. “The idea was brought forth and we ran with it,” he said. Hedrick said they obtained a Community Policing Development federal grant through Community Oriented Policing Services in 2017 and started the program in 2018. When asked about the name of the program, he said they worked with Native American leaders to help name the program and Akicita refers to law enforcement and the military — the closest translation meaning guardian or protector. The grant allowed the department to get a support specialist to create the connection between the police and the students. Police officers apply to be a mentor with a student in the school’s criminal justice or law enforcement program. Students from all walks of life are welcome to participate in the program, which is focused on Native Americans. He said the main goal was to boost not just Rapid City, but law enforcement in general. Aside from gaining more qualified candidates, especially those of Native American ancestry, the Rapid City Police Department wants to build trust with the community. “Historical trauma is a very real issue in this area. It starts with acknowledging the truth of our history. Wounded Knee is still very real to the people who live here. There’s a generational mistrust,” he said. She’s expressed at some point the desire to go back to the reservation where she was raised and be chief of police there. In South Dakota reservations have their own law enforcement. Hedrick said currently there are 19 officers and mentor-mentee partnerships in the program from Rapid City but added neighboring law enforcement agencies, as well as the Pennington County Sheriff ’s Office and highway patrol, are also involved. There are no strict guidelines for how the mentor-mentee partnership should operate. “My mentee was very interested in the day-to-day operations — how we spend our time, how we solve problems, etc. So I connected her with ride-alongs right away,” he said. If a student wants to be a detective or is interested in the court system or forensics, they are given the opportunity to see how those departments work. If the student has a general interest or is not sure, they engage them all across the spectrum. 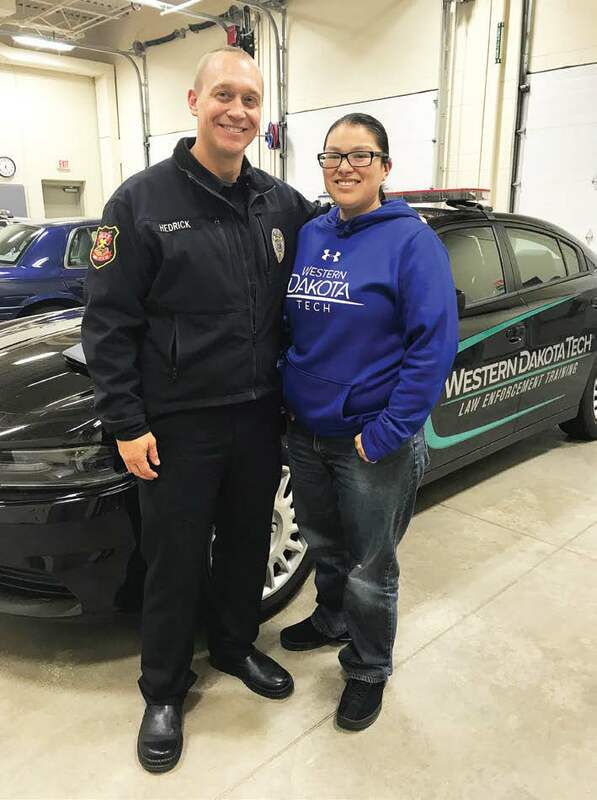 The first class is slated to graduate in May and they’re excited to see how many of the mentees will chose a career in law enforcement and be hired. But Hedrick said even if they choose a different path, they’ve learned about a career in law enforcement and believe the experience will have a ripple effect of trust. Hedrick said the city has a great number of homeless Native Americans and it is looking for a better way to deal with the mental health and drug issues they have. Another Rapid City initiative is the Trauma Enforced Policing, which is training specifically for the area that is put on by The Center for American Indian Research for Native Studies. He said it’s been especially helpful for officers who didn’t grow up in the area. Hedrick said the department hasn’t changed any hiring practices in order to obtain candidates, but it has tried to come up with creative solutions. Other areas across the nation have also been reaching out more to minorities and women candidates to better reflect their communities. A 2016 PBS “News Hour” report by Jen Fifield with Stateline — www.pbs.org/newshour/nation/can-diverse-policedepartments-ease-community-tension — cited a Dallas police chief’s call for young black men to stop protesting and start applying and fixing the problems. The article stated that police departments in Indianapolis, Ind. ; Minneapolis, Minn.; and Knoxville, Tenn., have also refocused efforts for more diversity on their forces. Reportedly communities see diverse forces as more legitimate, but even more important than diversity is having officers who have grown up in the community they serve. For example, the city of Baltimore has a pretty diverse force — 42 percent black — but most officers are not from the city nor do they live there. The article cited a former Salt Lake City police chief who said officers who come from the community will be aware of its history, any issues or conflicts and what it needs. According to another report, some communities are relaxing some of their hiring requirements in order to attract candidates in general. Some departments are dropping the four-year college requirement, easing up on infractions occurred while still in high school or dropping the agility test — the latter to attract more women candidates. Some reasons cited for the difficulty in getting qualified candidates for the force in a time when unemployment is low include a relatively low starting salary, disqualifying behavior, lack of physical fitness and credit issues. Most agencies are not as concerned about candidates’ credit scores. Because of that importance Orrick advises a more comprehensive manner to approach recruitment. Th e number of officers and needs of the department should first be identified through a staffing analysis and review of average turnover rates. Identifying the core values of the department is important — clarifying why it exists, what it represents and how it will conduct itself. Aside from identifying core values, the guide suggests developing a brand, stating that each department is known for something whether that be positive or negative, selecting recruiters and developing the culture that values recruitment. Some techniques suggested include instituting an employee referral system, which he claims is the most effective method of recruitment; using the internet and social media; establishing relationships with news media to publish human interest stories about the agency; keeping an open door policy for former officers to return to the department; targeting female candidates with viral recruitment; career fairs; networking with religious and cultural organizations; and developing youth and apprentice programs like summer day camps, explorer posts, etc.